I noted in the 2003 volume of The Rhododendron that member feedback is valued as a check on whether the Journal is properly reflecting members’ interests. It was pleasing that feedback that we did receive was generally positive. However, the more responses we get, the better placed we’ll be in trying to meet your preferences. We hope you enjoy reading this year’s volume. On behalf of all our readers I sincerely thank those who have provided contributions. 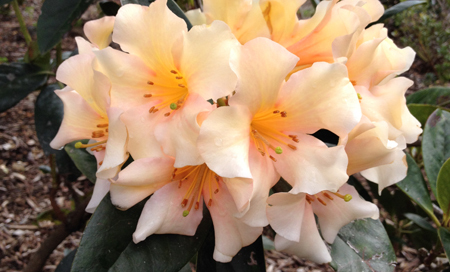 Or, more pertinently, we need your contributions to The Rhododendron, too. Everyone’s an “expert” at some things, and when they share their expertise this can bring greater enjoyment and success to others’ gardening efforts. I know that I’ve gained great benefit over the years from generous encouragement and sharing of information (not to mention plants) by a large cast of friends and acquaintances made within gardening circles. And one of the ways I’ve enjoyed these benefits is by reading what they have contributed to publications like The Rhododendron.